The goal was to get this blog out last Wednesday, you know... before the end of 2016, but this volunteer just couldn't get her act together. So for the first blog of the year, we'll do a recap of the previous crazy year. Like most years, January, February, and March are pretty 'bare' months but these pictures reflect the types of things that occur during the winter season- repairs of generators, refinishing doors, repairing painted-over whistles, and some welding and painting. Also, there were training sessions and practicing 'abandon ship'. 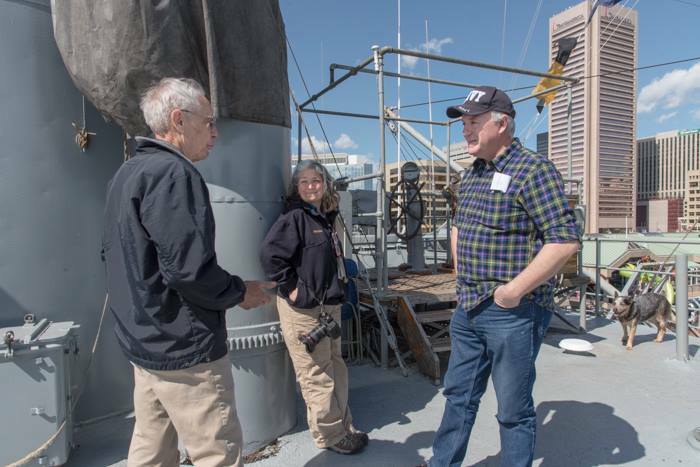 In March the ship spent a few days on the west wall of the Inner Harbor and was open to the public. Once things began to get warm, we had lots of groups use the ship for training, like the Navy reserves and the Baltimore City Police Department. There was also a big increase in work that needed to be done for the Norfolk trip. This included inventory of the ship's store, and more cleaning and general work, like painting and securing things and storing other things in the lower holds. May found the BROWN heading south to go to Norfolk, Virginia. We were there for a few days and had a living history on the Sunday that the ship was there. There were a few veterans that came to the ship with pictures of themselves in Merchant Marine uniforms from WWII or with their discharge papers. There seemed to be more WWII veterans on this Norfolk cruise than on our regular cruises out of Baltimore, so it was a great time. Crazily enough, the summer was a bit mellow on the BROWN as well. During this time the deck was painted through the grant that we received, and then a lot of major welding was done. Here are some pictures to remind us all of the work that was done. September came before we felt we were ready. After more than a year of work and planning, September came quick. We left for New York on the evening of September 8th and returned back to Baltimore on the 20th. This was an epic cruise for so many reasons-it was the return of the BROWN to NYC after many years, it was the venue for the alumni of the ship to meet and it was an amazing experience for the ship and crew to be out of the Chesapeake Bay. Here are some pictures of the NY experience. We're getting to the end of the year. October was 'the cruise that wasnt', something we are going to avoid next year by not having a Hurricane, I mean October, cruise. The BROWN was also chartered by the Blue Angel FDoundation, to watch the Blue Angels show. In November we had our holiday party for crew members. For many years this was done in December like most holiday parties are, but everyone froze their extremities off, so it was changed years ago to October. This year, due to having some members that can no longer do the climb, we decided to have our party off the ship. It was held at the Baltimore City Fire Departments Union Hall, and we had a great turnout. Finally, in November and December, a lot of work was done on the radio room, working to fix the system and make some modifications. As much as we feel that we had a great year, there was sadness this year, because each year we lose crew members, as time waits for no man. 2016 was especially sad for crew members because this year we lost some members unexpectedly and quickly; people that were too young. We are hopeful that we can avoid losing any more members in 2017. On the books for 2017, we have 2 living history cruises out of Baltimore and a visit to Fells Point, but plans are still being made at this time. We would also like to wish our readers a Happy, healthy New Year as we thank you for your support of Project Liberty Ship and the SS JOHN W BROWN.